Consistency creates familiarity, and familiar interfaces are naturally more usable. Consistency, however, does not equal uniformity. Design shouldn’t just be a game of templates, but at the same time, it should reflect the usability advantages of existing patterns. Understand why certain interaction design patterns are effective, then use them as a foundation for your creativity. 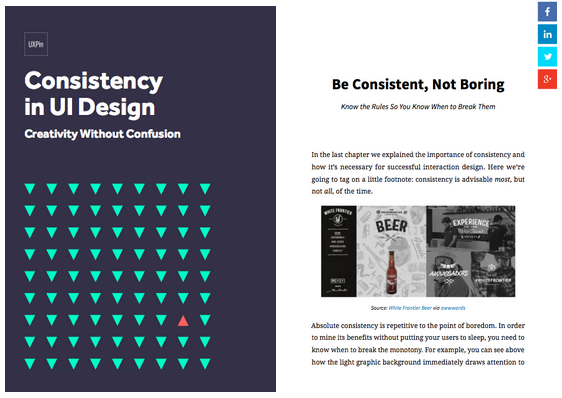 The free ebook Consistency in UI Design: Creativity Without Confusion explores how to strike the difficult balance between following design best practices and creating new ones. The book first describes why and how to be consistent, then dives into how to apply inconsistency to emphasize elements and create interesting interfaces. Detailed yet straightforward exploration of the two different forms of consistency, how consistency improves learnability, how to check for consistency, how to apply just the right amount of inconsistency, and more. Best practices from Jawbone, Reddit, Amazon, Dolce & Gabbana, and others. Cautionary examples from Xfinity, Adobe, and US Airways, and others. If you’re interested in UI design, the Web UI Design for the Human Eye series are also worth checking out. Feel free to share them with anyone who may find them helpful.